There are several reasons that clients sometimes try to skip the RFI step and go straight to an RFP. First, they may view the purpose of the RFI as simply a way to determine which vendors should be on the short list, and they may believe that they already know who they are. For example, a large multinational organization looking for a new ERP system may believe that only SAP or Oracle are qualified for the short list. For CRM, they may think that only Salesforce, SAP, Oracle, or Microsoft should be listed. Why go through the trouble of an RFI if they already know who should be on the list? Buyers may also think they can shorten the selection process by skipping the RFI. Writing the RFI, soliciting responses, and analyzing results can add weeks or even months to the project schedule. If the team can skip this step and go straight to an RFP, significant time can be shaved from the evaluation schedule. This can be tempting when business leaders want to get started quickly with the implementation. The final reason is budgetary. The cost of the new system is only determined at the end of the process. If the client is budget-constrained (and who isn’t), the client would like to know early in the process what the new system will cost, sometimes so they can decide whether to move forward. Issue the RFP up front, they think, and we can get that cost information early. Now, let’s look at the purpose of the RFI, the value it brings to the process, and why buyers should resist the temptation to skip this important step. Casting a wide net. Many buyers think they already know which vendors should be on the short list, but that knowledge is often deficient. Often, they know about vendors that historically have served their industry, but they miss newer vendors that represent the future. Educating the vendors. If you skip the RFI step and go straight to an RFP, you guarantee that bidders are going to want answers to a multitude of questions in order to give you a proposal that has any quality at all. A well-written RFI presents necessary information about the buyer’s organization, project, and key requirements to allow vendors to respond simply with their capabilities. They do not need to respond with a detailed cost proposal, lowering their presales effort, making them more likely to respond. Selling the opportunity to vendors. At every stage of the selection process, not only is the buyer evaluating the vendor, the vendor is also evaluating the buyer. The vendor is constantly asking: is this a good deal for us? Does this buyer have its act together? How much work is it going to be to close this deal? The best vendors have more opportunities than they have presales resources. They are constantly looking for reasons to take themselves out of deals. You want the best vendors to be excited about your deal. A well-written RFI gives candidate vendors a positive impression about the buyer and makes them more likely to want to pursue you as a customer. Testing vendor responsiveness. The RFI process also gives buyers a low-cost early peek at how easy (or difficult) each vendor is to deal with. It is surprising how often a well-known, well-qualified vendor simply does not act like it wants the deal. The situation rarely improves after the sale. Establishing a foundation for demonstrations. A well-written RFI defines key requirements and provides a preliminary evaluation of a vendor’s capabilities. This is an essential foundation for developing good demo scenarios. During the demo, you can focus on areas of particular criticality to your organization or areas where the vendor’s capabilities may be uncertain. Without an RFI and a vendor’s response, you may develop generic demo scenarios or, worse, the vendor may simply give its standard canned demo. Identifying/qualifying partners. In many deals, you are not dealing with the software vendor directly, but rather with value-added resellers and implementation partners. An essential part of the RFI process is identifying the best partners to deal with for a particular vendor. Without an RFI process, you may be rolling the dice as far as which partner gets assigned to your deal. Occasionally, for some vendors, we may ask two partners to respond to an RFI and then make a decision on which partner to use going forward, based on the quality of their RFI response. A well-conceived RFI does not need to add significant time to the evaluation process. 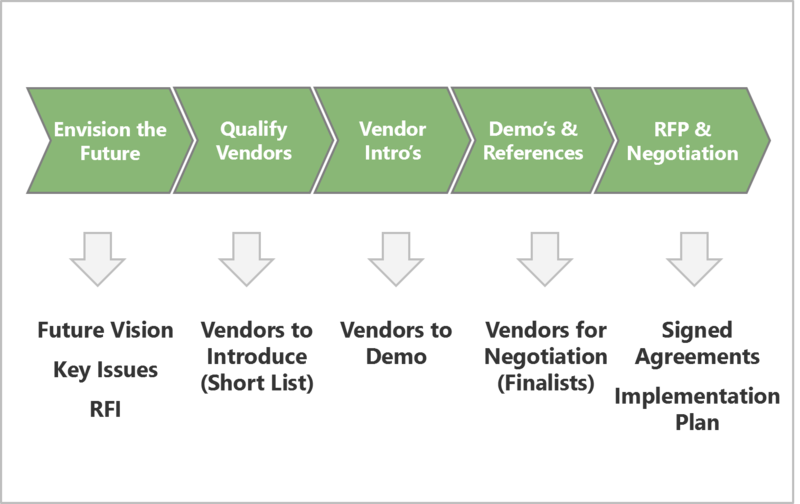 Most of the time saved by skipping the RFI simply moves to the demonstration and RFP stage as vendors need more time to gather information that they could have gotten earlier in the RFI process. Moreover, responding to an RFP—with a cost proposal as well as a technical proposal—is an expensive effort for vendors. Some vendors will look at an RFP and simply decide to walk away. The best practice is to break vendor evaluation into two stages. First issue a concise RFI to a longer list of candidate vendors. Based on their responses, then decide who to bring in for an introductory meeting. Based on the introductory screening, decide who to allow to demonstrate for a more in-depth evaluation. Only then do you issue the RFP for two or three finalists. By now, those finalists will be well-educated, excited about the deal, and able to provide a quality proposal. This entry was posted in CRM Selection, ERP Selection, HCM Software Selection, Supply Chain Management SCM Selection and tagged CRM, ERP, ERP Selection, SCM, Vendor Selection Consulting. Bookmark the permalink.